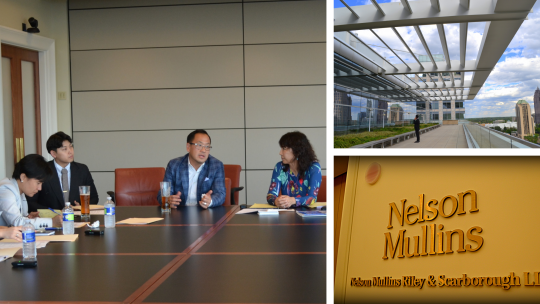 Platinum Sponsor Nelson Mullins, courtesy of Partner June Jeong-Hwa Lee, will host the IAKL Board of Directors Meeting (both Korea and Overseas) at their office in Atlantic Station. Lunch will be provided. Gather in Grand Hyatt Main Hotel Lobby to walk to the Opening Reception at Greenberg Traurig (next door). 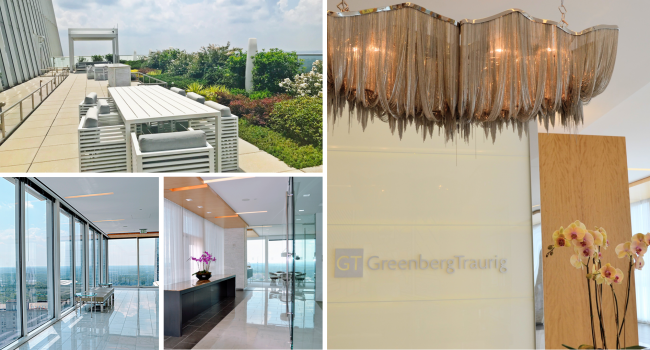 IAKL's Opening Welcome Reception will hosted at the gorgeous office of the law firm Greenberg Traurig, Terminus 2 Building, 3333 Piedmont Rd., NE, Ste. 2500, Atlanta, GA 30305. The event will feature modern and traditional Korean cuisine by J&J Catering. While the United States Supreme was deliberating U.S. v. Microsoft (on whether a subpoena issued by a United States federal court required Microsoft to produce documents on a server in Ireland), Congress passed the Clarifying Lawful Overseas Use of Data Act ("CLOUD Act")—supported both by Microsoft and the Department of Justice. Hear an expert panel of international practitioners discuss the impact of the CLOUD Act and other international legal considerations on the manner and process of handling exterritorial discovery issues. In the aftermath of the Korean War, tens of thousands of Korean children were sent abroad and adopted. Today, this community faces unique challenges, including potentially thousands who are stranded without citizenship in the US. This panel will explore legal assistance and policy changes that can benefit adoptees in the US and in Korea. Pre-packaged restructurings (or “prepacks”) are an increasingly common option in formal insolvency proceedings, particularly for large corporate debtors or those in need of prompt restoration of business, as they can generate significant time and cost savings. Prepacks can lessen the time a corporation is actually in formal insolvency proceedings, minimizing the stigma associated with “bankruptcy”. Prepacks have been widely and effectively utilized in insolvency proceedings in the US bankruptcy courts, which practices are modeled and adopted by other jurisdictions. On the other hand, UK bankruptcy law has implemented a different type of pre-packaged restructuring. After the opening of Seoul Bankruptcy Court in Korea in 2017, prepacks have been adopted in several insolvency proceedings, but are expected to be utilized more by large or medium-sized companies under the supervision of the bankruptcy court. This session will review the use of prepacks in Korea, the US, UK, and Canada, and explore the benefits and risks of utilizing prepacks in an insolvency proceeding. In the 4th industrial Revolution, including AI, BigData, and Fintech, use of information data is critical. On the other hand, privacy related laws throughout the world have been strengthened in recent years. For example, General Data Protection Regulation (“GDPR”) in Europe has been effective as of May 25, 2018. The State of California recently enacted the California Consumer Privacy Act of 2018. In addition, Korean privacy related laws make difficult to transfer data among businesses, which is critical to the new industry revolution. Under this circumstances, what attorneys need to know about the privacy laws in relation to the new industry? This year’s IAKL Conference is the first one to take place in the U.S. during the Trump administration. His election as President has brought about notable shifts in various aspects of economic policy in the U.S. and, often in response to those American policy changes, the rest of the world. How has U.S. antitrust enforcement changed under the Trump administration, if at all? And what about in the rest of the world? With the 2018 IAKL Conference taking place almost two years into Trump’s presidency, the panel will seek to conduct a brief retrospective of enforcement actions and discuss the status of antitrust enforcement in the U.S. and throughout the world. CLE 203: #MeToo—Why Now and What it Means for Lawyers as Counselors and as Professionals? #MeToo—Why Now and What it Means for Lawyers as Counselors and as Professionals? What do celebrity chef Mario Batali, Hon. Alex Kozinski (U.S. Court of Appeals, 9th Circuit), and former news anchor Matt Lauer all have in common? You guessed it – they are among the dozens of high-profile men and women who were ousted in the #MeToo movement. It’s not just big news either, it’s liability for our clients and maybe even a source of discomfort for us as professionals. This panel will explore sexual harassment from a cross-border perspective, and focus on how it affects lawyers in two ways: as advocates and counselors for clients and as individual professionals. The panel will explore unique angles of the legal and sociological underpinnings of sexual harassment, and openly discuss how #MeToo has both challenged and changed the landscape for our clients and for our profession. 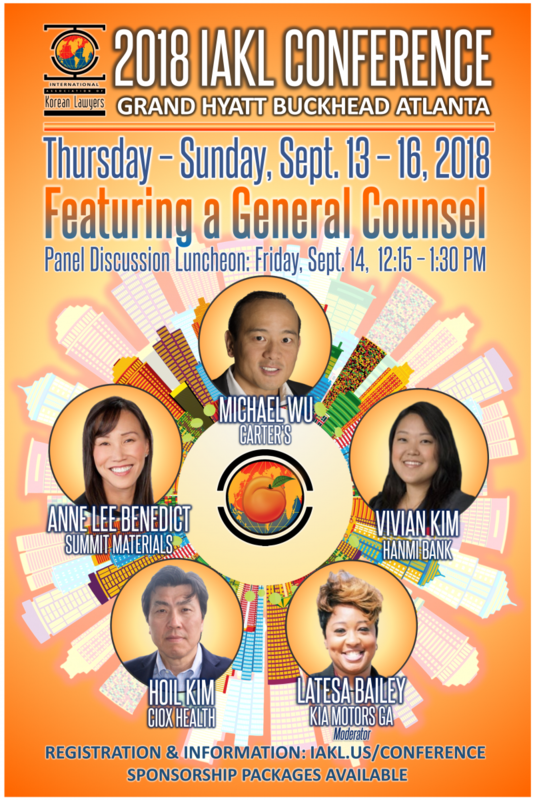 IAKL's Friday Plenary Luncheon will feature a blockbuster General Counsel Panel Discussion on the Path & Pitfalls on the way to becoming GC. This is a plated lunch, and attendees are requested to select their entree item in advance for an accurate menu order to the hotel. As Korea emerges as a major jurisdiction in cryptocurrency trading, there is an urgent need to take stock of all the laws and regulations that may come into play when being engaged in the business of digital currency in Korea. Such laws and regulations not only include the highly complex and unsettled Korean laws relating to digital currency, but also the increasingly aggressive U.S. and European regulators who are looking to regulate activities that may affect their investors. Non-Korean investors face unique difficulty in trading in Korea due to its highly restrictive capital control laws. On the other hand, the U.S., in particular through the SEC and the Commodity Futures Trading Commission, has shown a willingness to directly regulate exchanges and other financial intermediaries outside of the U.S. territory. This panel will give a brief overview of the most relevant domestic regulation for each jurisdiction, and also consider the issues arising in international business litigation involving cryptocurrency. The Tax Cuts and Jobs Act of 2017 has significantly changed U.S. tax laws, materially altering the landscape for cross-border investments involving the U.S. Most significantly, the U.S. has instituted a “hybrid” territorial tax system for direct investments by its corporations, subject to an array of exceptions aimed at clawing back intangible income and other anti-erosion provisions. This panel will explore the impact of these changes on direct and portfolio investments involving the U.S., Korea and Canada, while also providing an update on relevant tax changes in these jurisdictions. The Southeastern US has become a major destination for incoming companies from South Korea and elsewhere, particularly manufacturing facilities. As highlighted by the “Amazon HQ2,” companies can often negotiate specialized incentive packages and obtain government assistance in selecting a site. Each jurisdiction, however, is governed by a different set of rules that can affect taxes, bonds, operations, employment, and financial incentives. How do companies initiate the site selection process and what should companies consider in the process? Most of all, how can companies get the best incentive package? This panel is not to be missed! Arndt Siepmann, City of Auburn Economic Development Dept. Since its inception, securitization has been regarded as one of the most innovative and useful tools to raise financing. With the 2008 financial crisis, however, securitization was harshly criticized as one of its main causes and since then, has been on the demise. Nonetheless, a decade later, securitization is on the rebound. In this session, we examine the merits of securitization and the restrictions and advantages under the current laws and regulations adopted after the 2008 financial crisis in different jurisdictions. Significant changes, such as the introduction of IFRS, that has considerable impact on the debt capital market of Korea, will be explored as well as frequently raised legal or tax issues in each jurisdiction. Lastly, we take a look at the most cost efficient and legally effective transaction structures that are being developed in this new era of securitization. Joon Hwang, Littler Mendelson, P.C. IAKL's Friday Night BBQ & Beer Dinner is hosted by our Platinum Sponsor Nelson Mullins. The evening will held at Atlanta's famous Sweetwater Brewery, 195 Ottley Dr NE, Atlanta, GA 30324, catered by the award-winning Fox Brother's Barbecue. IAKL's Famous Friday late night event #IAKLateNight is sponsored by the law firm of Bird Marella. 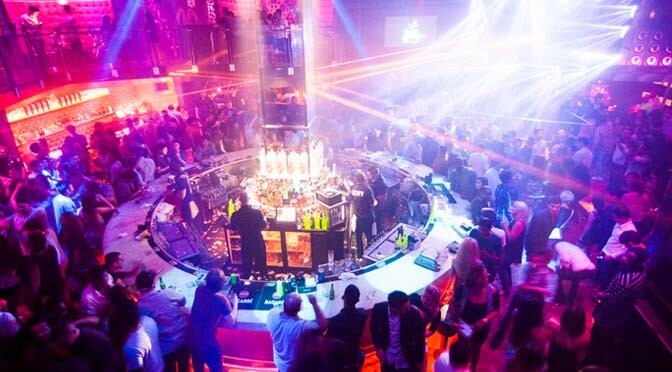 The event will be hosted at Tongue & Groove, Atlanta's premier night club, from 9:30 - 11:00 pm. We will have a space reserved for 100, and offer complimentary open bar for a specified period of time to IAKL attendees (NOTE: After that, it will be cash bar). CONTINENTAL BREAKFAST only (no Southern Buffet, which is only for Friday morning). CLE 501: Marijuana, Offensive Trademarks, and Cybersquatters, Oh My! Marijuana, Offensive Trademarks, and Cybersquatters, Oh My! From the protection of controversial trademarks, including the expansion of Cannabis branding in Canada and offensive and disparaging marks in the U.S. (e.g., FUCT and SLANTS), to combatting cybersquatters in Korea and elsewhere, this panel will discuss the hotly debated and edgier topics currently trending in Trademark and Domain Name laws. The panel is composed of young lawyers, a managing partner, and an experienced legal recruiter. Based on their individual experiences, the panel will share and discuss the challenges young lawyers face and how to deal with them. Various topics will include how to get hired for your first job, factors to consider when deciding new career paths, relationships inside and outside the office, qualities required as law firm attorneys, and how to contribute to society. This panel will discuss how the controversial Trump Administration has radically changed U.S. employment migration and its resulting impact on global companies. Recent U.S. immigration regulatory and policy changes, Executive Order impact, new U.S. Citizenship and Immigration Services memos, and increased Department of Homeland Security enforcement will be highlighted. The program will explore the rising trend of nationalism and how it will affect global mobility programs and immigration laws for foreign employees. The panel will consist of immigration experts from Korea, the U.S. and Canada. Joshua Kamen, Founding Partner, The Law Offices of Joshua A. Kamen, P.C. J.S. Kang, J.S. Kang, Esq. How far can the U.S. Department of Justice (“DOJ”) reach in its prosecution of conduct committed by foreign nationals abroad? For instance, how far can the U.S. government go in prosecuting bribes paid by foreign nationals to foreign government officials in a foreign country? Can you, a Korean national living in South Korea, be charged for insider trading by the U.S. Securities and Exchange Commission (“SEC”) for setting up a brokerage account in the United States and letting your friend make trades with the account? In recent years, the risk of a foreign company and a foreign national being investigated and charged by the U.S. government for violations of U.S. financial laws and regulations has been widely discussed and well established. For instance, earlier this year, a former Venezuelan government official, after being arrested in Spain and being extradited to the United States, pled guilty for his role in an international money laundering scheme involving bribes paid to Venezuelan government officials. Our panel of experienced attorneys and experts in this field will examine the legal principles surrounding extraterritorial application of U.S. financial laws and regulations and cover issues associated with foreign evidence gathering and extradition of foreign nationals to the United States. The panel will also address practice points on how to respond to multi-government investigations, including conducting internal investigations and negotiating and cooperating with the DOJ and the SEC. This panel will provide an update on recent developments relating to privacy and data security issues, such as breaches at Equifax, Facebook, and other reported data breaches, as well as regulatory reaction such as the New York Department of Financial Services’ cybersecurity regulations. The IAKL General Assembly will take place concurrently with the Saturday Luncheon. This meal will feature a true Southern Buffet luncheon, including fried chicken and fried green tomatos! 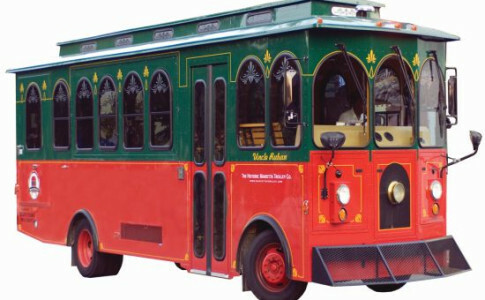 Join a special chartered 2.5 hour tour of Atlanta, conducted by the Peachtree Trolley Company. The tour will introduce you to the "Must-Sees" of Atlanta. Learn the history and enjoy the stories and legends of the city. The Trolley will go down along Paces Ferry Rd. -- a prominent part of Buckhead--then head down along I-75 and exit at the famous Varsity Restaurant and go through Georgia Tech University. A short drive from the GATech campus are the Atlanta downtown attractions: Centennial Park, the Georgia Aquarium, World of Coke, Center for Civil and Human Rights, CNN, the Mercedes Benz Stadium and Phillips Arena. The tour will also go by the historic MLK Center and come up along the Auburn Ave. to Woodruff Park. Then it will head down Peachtree St. to the Fox Theater, Margaret Mitchell House, Federal Reserve and Woodruff Arts Center. The last stretch of the tour will cover Rhodes Hall and return through Ansley Park to showcase many southern-style homes, before returning to the Hotel. Meet at Lower Lobby Entrance for a Trolley Tour of Atlanta. Pick up from the hotel is 1:30 pm on Saturday, Sept. 15th, returning to the hotel by 4:00 pm. Cost is $45/per person. The trolley has a maximum capacity of 28 people, after which a waitlist will be employed. It is first come, first served until filled. Over 300 lawyers of Korean descent from over 25 countries will connect at the IAKL Conference. The IAKL Mentorship Program aims to take full advantage of this opportunity, and provide an international approach to assisting young lawyers and law students have a truly global perspective. To help facilitate effective mentorship pairings and groups, we ask that you respond to the MENTORSHIP PROGRAM SURVEY. The President's Reception is a Pre-Gala Cocktail Hour. It will be held at the Grand Hyatt Japanese Garden, on the 3rd Floor. This will be open bar for Beer & Wine for one hour. 2 CASH BARS will then move downstairs and will be available during the Saturday Evening Gala, beginning at 6:30 pm, in front of the Grand Ballroom. IAKL's Saturday Gala Finale is hosted by our Diamond Sponsor Ballard Spahr. The Gala will feature as our Keynote Speaker the Hon. Byung J. ("BJay") Pak, U.S. Dist. Atty., N.D. Ga., the first appointed Korean American U.S. Attorney. 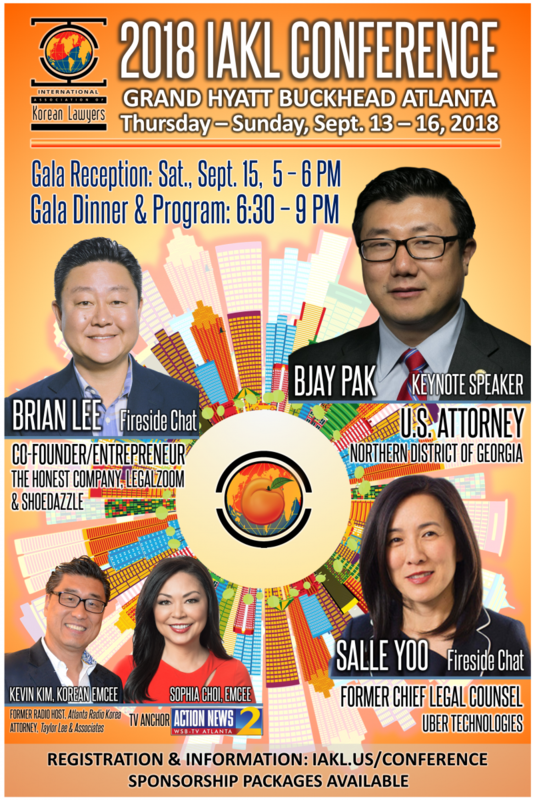 The evening will also feature an intimate fireside chat with two of the most prominent Korean American attorneys in the legal industry: Salle Yoo (former Chief Legal Officer of Uber) and Brian Lee (co-founder of Legal Zoom, ShoeDazzle and The Honest Company), moderated by Jinho Alex Yim (Nixon Peabody). IAKL will give a farewell tribute to departing IAKL Directors, as well as award the inaugural Han C. Choi Scholarship. This is a plated dinner, and attendees are requested to select their entree item in advance for an accurate menu order to the hotel. The 2018 IAKL Golf Outing will be held on Sunday, Sept. 16th, at Bear's Best Golf Course, with the first 4-some tee-off time at 8:30 am. The club is located at 5342 Aldeburgh Drive, Suwanee, GA 30024, approx. 35 miles (50 minute drive) from the Grand Hyatt Hotel. We must have a minimum of 12 players and a max cap of 24. Because our group size is small, this is NOT a shotgun start, and will be progressive play. Play will conclude by 1 pm. Transportation to and from hotel (minibus, max cap 15; others will have to drive or go with volunteers). NOTE: If you must leave early to catch a flight, you MUST make your own travel arrangements. The hotel bus pick-up departs at 7:00 am, and arrival back at hotel is estimated to be 3-3:30 pm. Bear's Best Atlanta is a high-end daily fee course focused on corporate entertaining, golf outings and providing the experience of a luxurious private club at a public facility. 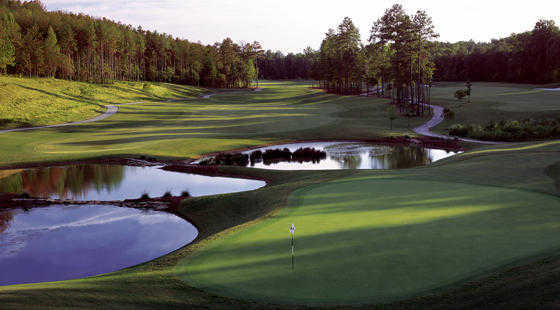 Jack Nicklaus selected the best 18 holes from more than 200 course designs worldwide and put them into one extraordinary round of golf at Bear's Best Atlanta.